The Forest of Dean, Gloucestershire! A fantastic natural playground set in beautiful surroundings, whatever the season - walk through the bluebells in Spring, appreciate the dappled shade in Summer, marvel at the autumn colours, track the deer prints in a winter wonderland. If you are after full-on-action, a stroll or ride; sun or snow or a de-stressing week with your pet, there's something to suit everyone in the ancient Forest of Dean., and it is right on our doorstep! 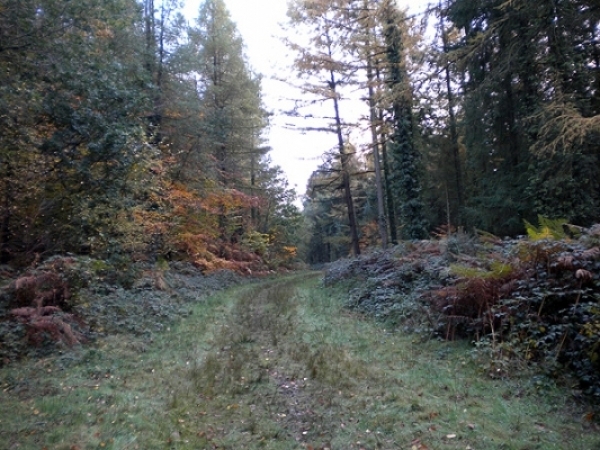 Footpaths lead from Deanwood Campsite straight into the Forest of Dean. Easy Access. There are routes at Mallards Pike Lake and the Cyril Hart Arboretum in the Forest of Dean which are suitable for those in wheelchairs. Symonds Yat Rock is also accessible from the carpark. The 'Twelve Easy Walks' leaflet gives details of circular manageable strolls in the Forest of Dean. Cycles can be hired from Dean Forest Cycles at Parkend, only 3 miles away from our Forest of Dean Holiday Cottages, also Pedalabikeaway in the Cannop Valley, and Forest Bikes & Outdoor Leisure at Coleford. Alternatively, bring you own bikes. We have secure, undercover bike storage here at Deanwood, and also drying facilities and hanging space for wet clothing. As well as a good selection of tourist leaflets, we also have a selection of maps and leaflets of special interest to the keen walker here in the office at Deanwood House, including The Peregrine Path, Offa's Dyke National Trail, Gloucestershire Way and the Wye Valley Walk. For the cyclist, we have several booklets and maps covering Cotswold villages, South Gloucester, Bristol etc as well as the Forest of Dean. Most are available free of charge but some can be purchased or borrowed on deposit.